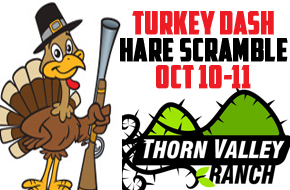 Book your calendar a for-fun Turkey Dash hare scramble Oct 10-11, 2015 at the beautiful Thorn Valley Ranch natural MX/HS track near Carbon, AB. Private land owners are opening up the track for the Second Gear Club to enjoy some fun racing for all classes. 6:00pm Thanksgiving potluck dinner with deep fried turkey Saturday only (turkey and potatoes, gravy, stuffing and buns provided). General rules for potluck is to bring a favorite dish that would feed your family (4-6 people). Not big on cooking? then bring an appetizer or dessert. Also, we would welcome a few extra slow cookers and extension cords. Also, bring your own drinks. 9:00pm Fireworks thanks to SG Locating! Registration onsite both days. Call or txt for more information 403-616-1292.